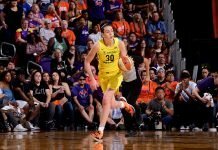 Wings forward Glory Johnson wasn’t happy with the language used by Phoenix fans against her and her team Saturday night. Towering newcomer Felicia Aiyeotan will bolster Virginia’s front court. Vanderbilt’s Carolyn Peck is a superstar assistant coach. McNeese State’s coaching staff is complete. On a day when all teams arrived in Tampa…..